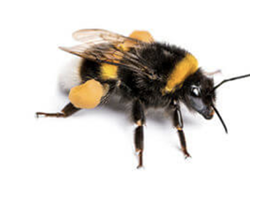 Wasps are much less furry than bees. They are yellow and black in colour. 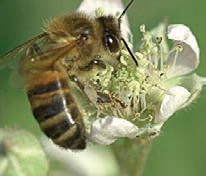 If you are seeing large numbers of wasps or bees, there is likely to be a nest nearby. Wasps produce a papery material to build their nests, which they tend to build in sheltered spots. Check under trees and bushes, in sheds or garages, and under eaves. Initially, they might be the size of a golf ball, but they will grow much larger if undetected. Wasps and bees can be a nuisance if you have food or drinks outside. They can deliver a painful sting which, in most cases, causes no long term harm, but can be life threatening if you are allergic to stings. 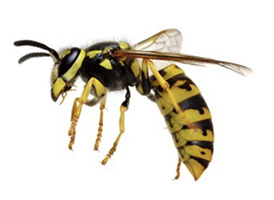 Wasps have the potential to attack in large numbers if their nest is disturbed. Please do not attempt to destroy or move a wasp nest yourself. Seek professional help. Cost - £54 (Treatment for one nest). If you can see bees or wasps entering and leaving your property in more than one place, there is likely to be 2 or more nests. If you pay for more nests than we need to treat, we will provide a refund. Normally nests can be treated using telescopic poles, if ladders are required, there will be an additional cost of £15.